In our family, I sometimes feel like we’re going through a million pairs of clothes. Everyone has their different after-school activities and inevitable something will get dirty. Laundry can feel like a HUGE task, but I try to use some hacks to make laundry day run as smoothly as possible. From school clothes to soccer jerseys and cheer uniforms there’s always so many different patterns and colors. Trust me when I say no one likes it when the colors bleed onto each other and ruins someone’s favorite shirt. Plus there’s nothing worse than washing a striped shirt and having the blue or red spreading onto the white stripes. Something that I have found to be a HUGE life saver is Color Catchers. They’re these awesome sheets that you can throw into your washing machine to absorb the colors to keep them from spreading to other clothes. 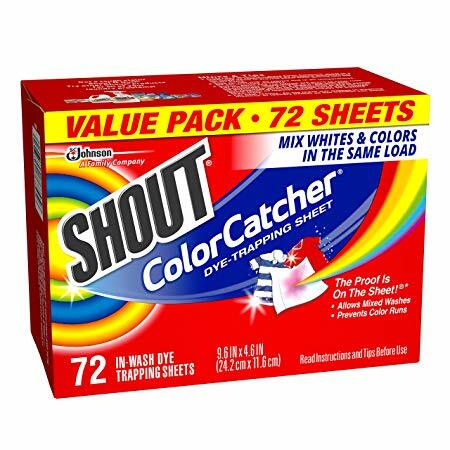 I typically use Shout Color Catchers. You can buy them at pretty much any grocery store or only at places like Amazon. A value pack comes with 72 sheets and costs around $10.99. Honestly, these keep our colors in our clothes looking way more vibrant instead of a dingy mess. So that means that the clothes last longer and of course that life is a little easier.